Uod is a smart lamp. It is capable to discover the user, understand a particular functional circumstances and an environmental context; later it proposes the most comfortable solution and ideal to allow doing what is preferred, without exceeding in the mechanisms and energy consumption. 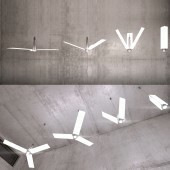 It is anchored to the ceiling however able to turn into a table lamp for reading or working, placing its own illuminated surfaces in parallel to the working surface to improve the visual comforts of the users. The transformation, from a triangular base prism to an unidentified illuminating object, occurs independently. 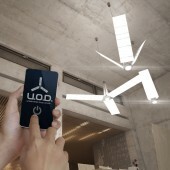 Uod is connected via bluetooth to each frequent users mobile, which is the tool used to feel the light on the table during the users work. At this point the oled panels start the orientation until the smartphone will report to the chandelier that the light is enough to do the willed function in the best way. Therefore the illuminating panels stop themselves. The app which manages the measurement of the light intensity also has a manual regulation system of the light power and the chandelier’s shape configuration. Started in March 2016 and finished in November 2016, in Teramo. Materials: brushed aluminum, steel, OLED panels, electronics. The manufacturing process is done by press,bending, turning and cutting the elements. Hereabove it is possible throughout a system of mobile stemswhich bend the extremely light oled panels allowing the direct light on the underlying working area. An electrical box coordinates all the system and connects the chandelier to the mobile devices. W 1100mm x D 1100mm x H 500 mm In particular: Open 1100 mm of diameter. Close 200 mm of diameter. Chandelier height: 500 mm. Besides the comfort of oled light use, it is added an important energy saving. 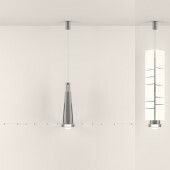 The chandelier uses not only the oled panels but also its transformation system to minimize the energy delivered; in fact in this way it doesn’t need to increase the power of the lighting sources but only to change thier position to improve the visual comfort on the beneath working surface. I wanted to focus on the user experience and try to combine a functional tool and an image archetype in order to produce an innovative object that guarantees flexibility and functionality, while keeping that familiarity of the object we're used to seeing. By using these familiar images, creating a hybrid of parallel world and languages, we decontextualize these forms and give them new meaning and make our lives better. The object fulfills its task by being innovative, not technological. Today the objects are smart,but I want CLEVER objects; not just for being connected and automated, but in their design as well. Being online just allows them more immediate and powerful characteristics. 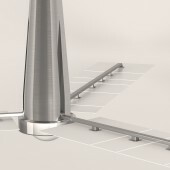 The challenge here was to create a smart and sensitive object not only using high technology, but also turning something ordinary into something more, making it very user friendly and giving it a unique design and concept. 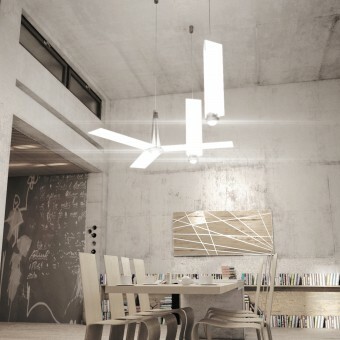 Uod Chandelier by Concepticonstudio is a Nominee in Lighting Products and Lighting Projects Design Category. · Click here to register today inorder to be able to view the profile and other works by CONCEPTICONstudio when results are announced. Uod Chandelier by Concepticonstudio is Winner in Lighting Products and Lighting Projects Design Category, 2017 - 2018. 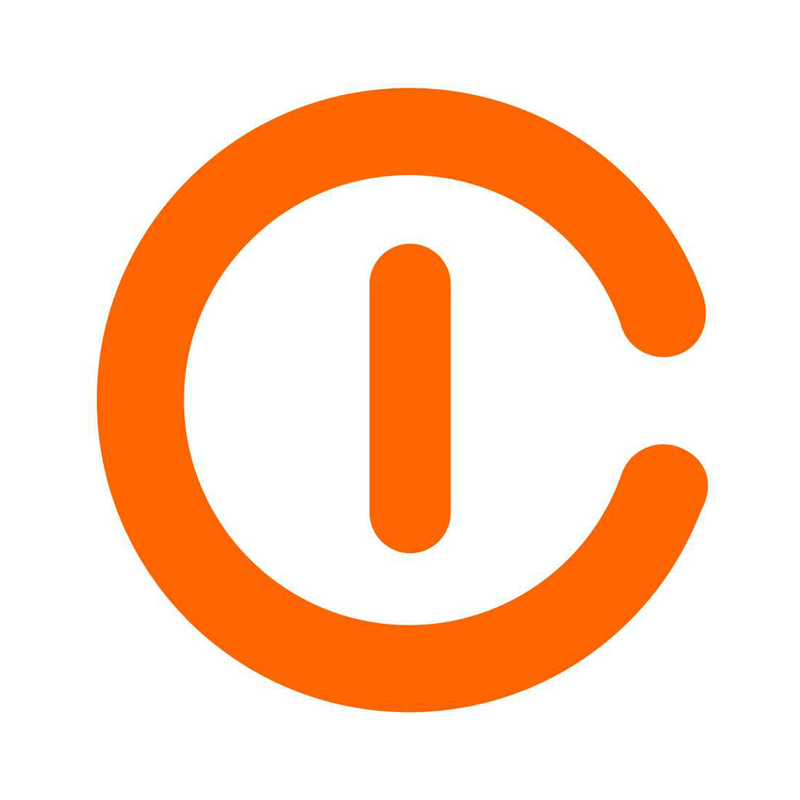 · Press Members: Login or Register to request an exclusive interview with CONCEPTICONstudio. · Click here to register inorder to view the profile and other works by CONCEPTICONstudio. Did you like Concepticonstudio's Lighting Design? Did you like Uod Chandelier? Help us create a global awareness for good lighting design worldwide. Show your support for Concepticonstudio, the creator of great lighting design by gifting them a nomination ticket so that we could promote more of their great lighting designs.